though I do love having small tables in a room to set little pretties on! 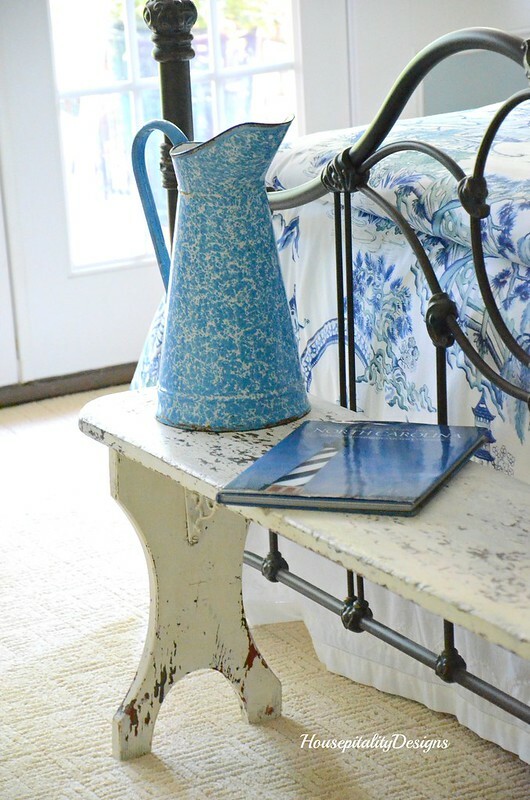 to use with the night stand doubling as a desk. It then began the color scheme of blue, white and green. and added more texture using vintage books. to add a beautiful soft scent to the room. I packed away the antique quilts that were on the bench at the end of the bed. The vintage French enamelware pitcher remains on the bench. I also removed the basket that was underneath the bench filled with magazines. so these were placed in my French market basket. 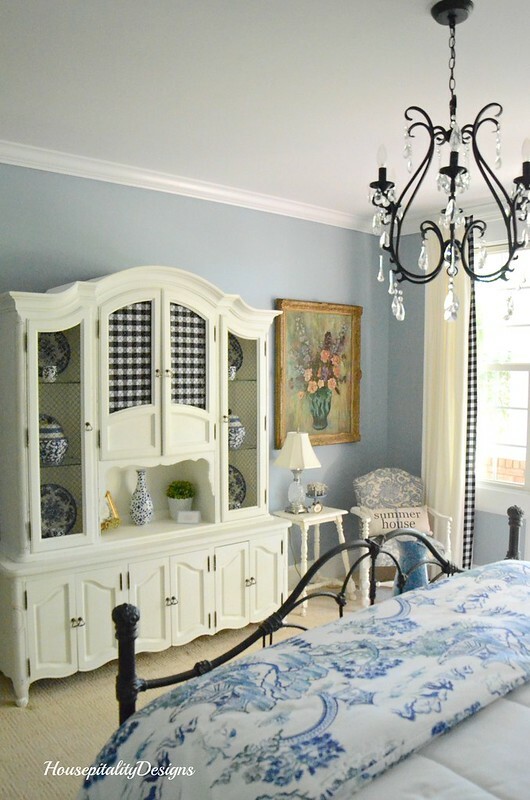 other than an antique round table that was to the left of the hutch. It was one of those pieces that I loved and “found a spot” for it. shuffled over to the upper porch of blue and white. The bedding has pretty much remained the same for a while in this room. I occasionally switch out some pillows for the seasons. I thought it best to wait for the “right-sized” house. It may be a while, so I have plenty of time to shop! I want to show you where I have been spending most of my time lately! At the kitchen island that has transformed into a packing station. I am packing away things that I won’t be needing for a while. Our storage unit is almost full. My resident expert organizer thinks I will still have lots of room for more boxes. Have a most beautiful day ….. I shall keep packing away! The bedroom looks perfect! I know it must be hard to edit out things but at least you have a good reason and there will be the reward of the new home in the future! 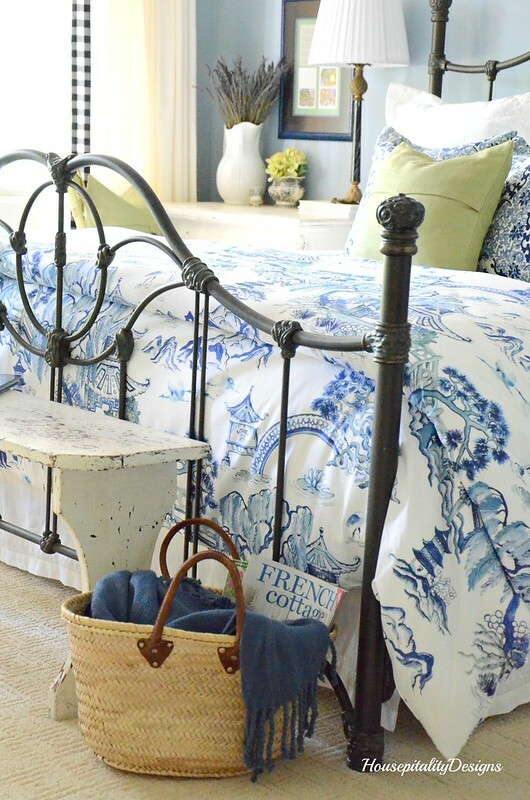 Love that bedding- I can’t imagine anything else in the room. Good thing too is you have a lot of things already boxed up so you won’t have as much to do once your area ready to move! Perfect in it’s blue, white and green. You are so organized and soon you will be finished. Then when you move to the right sized home you will get to unpack all the pretties again. That will be a fun day after the stress of moving and building. Shirley, this is so charming! A welcome any guest will love. What a beautiful room. Love the color combination, so soothing. 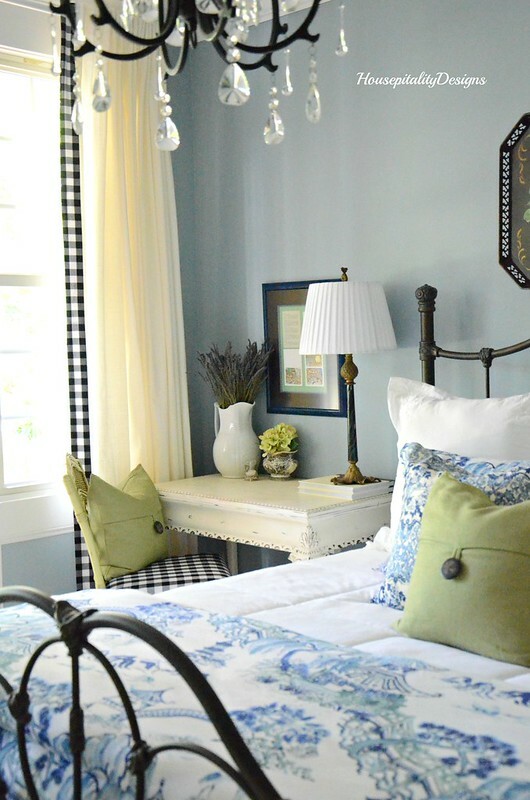 That is such a soothing guest room. When we knew we were moving away from Greenville SC I packed boxes of things I didn’t think I would need. I only thought they would be packed away for a few months because at first we were just going to buy a home, not build one. Those boxes have been packed away since June of last year, lol. 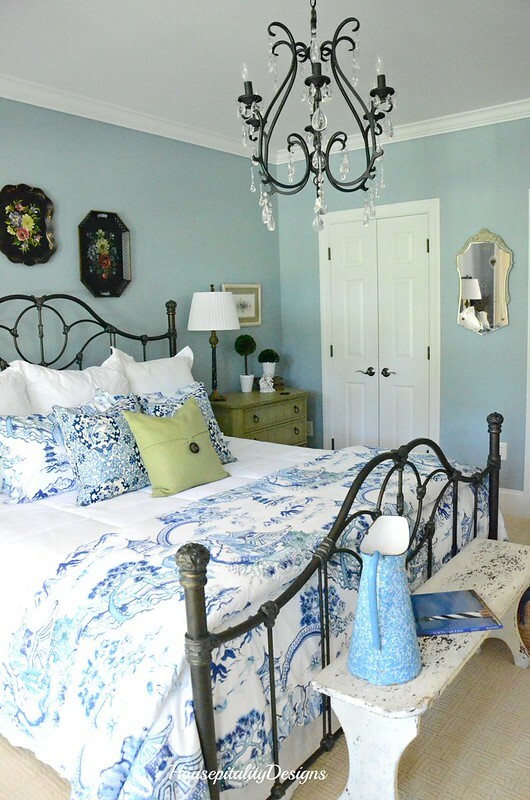 Your guest room always looks beautiful Shirley,I am impressed you continue to primp and decorate while you are preparing to move and packing boxes! 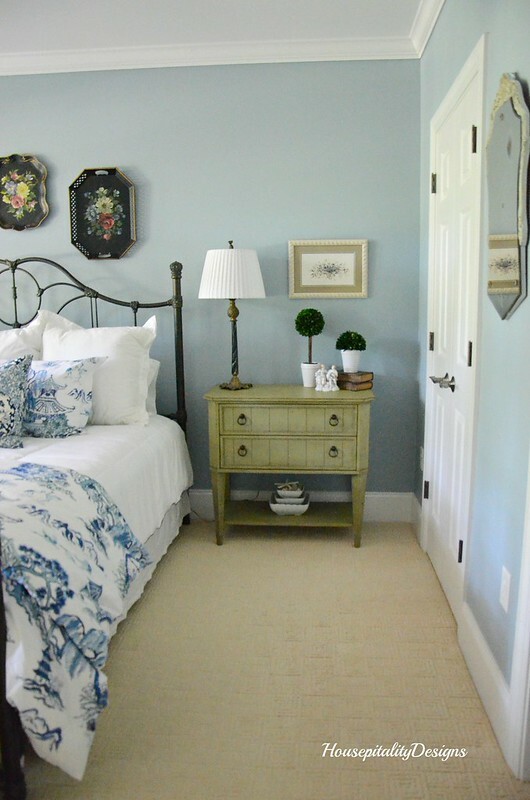 This room is just so lovely Shirley and your refresh of it is perfect! 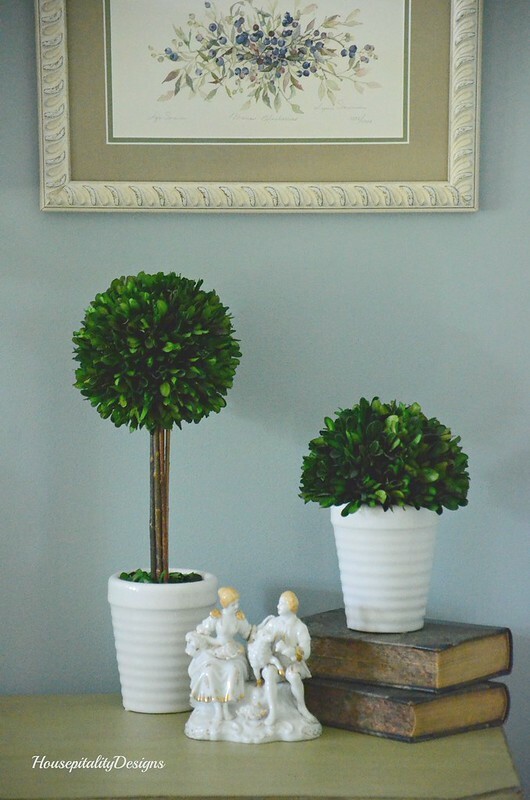 I love your blog and your decor . We share a love of tole trays, as well. As a retired realtor, of 33 years, you are very wise to pack away so many of your treasures. Sometimes when a home is so beautifully decorated a buyer thinks they just can’t live up to how beautiful the house is. I know that sounds crazy but i have many times found that to be true. So Keep packing! Can’t wait to follow your adventure! It looks perfect, friendly and inviting. Who wouldn’t like to be a guest in your house! 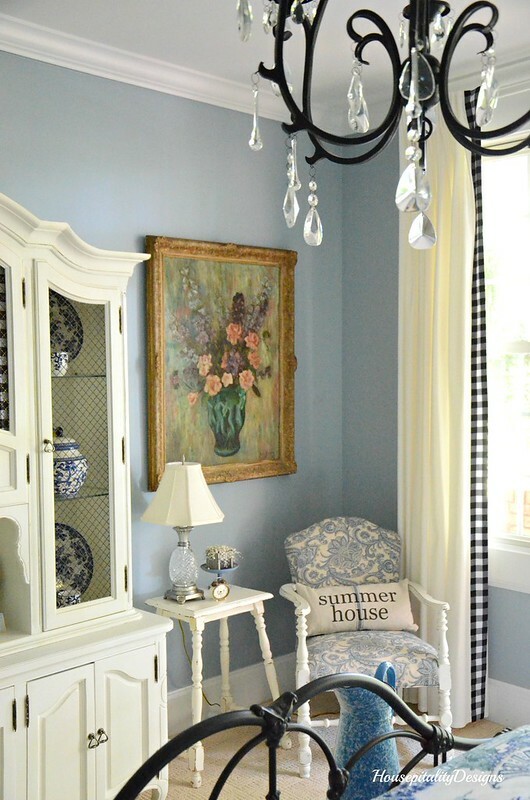 Love the blue and white with the black/white check trim…makes the room so welcoming and fun. 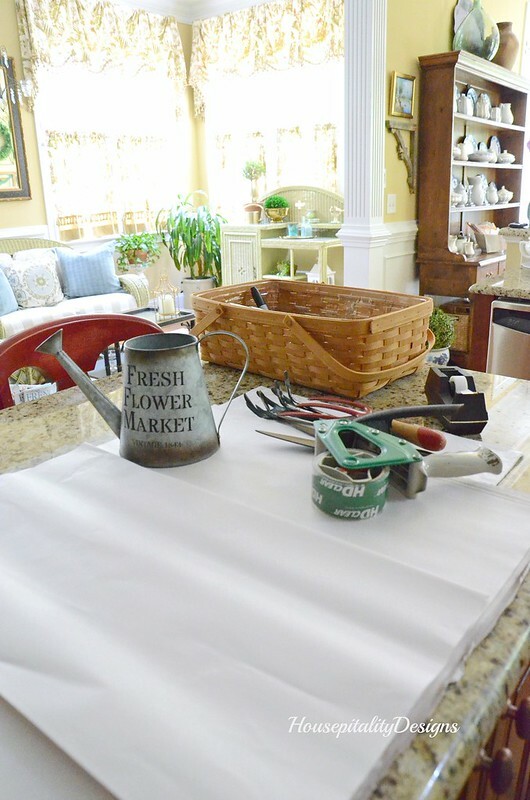 Jeanne’s recent post…An Oh So Boring Dress…To Make Fast! Pinky’s recent post…Dining Al Fresco! 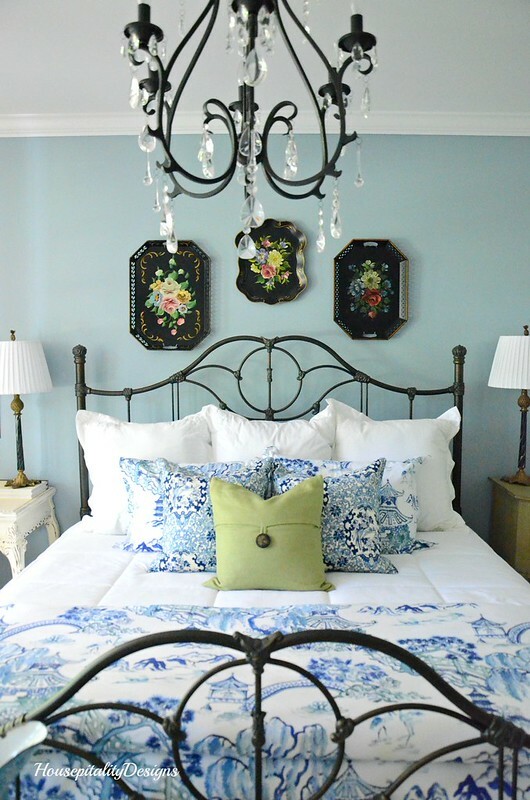 Shirley, I have always loved this room from the soft blue walls to the iron bed to the tole trays on the wall. 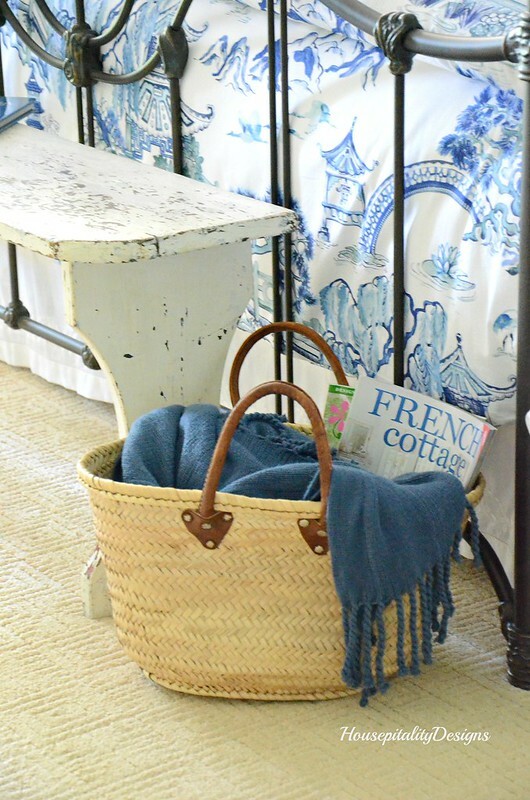 It is always perfect for overnight guests! Soooo pretty and welcoming and cozy. Love the blue and white. Love this. There is so much lavender growing in the wild all over New Mexico. It’s beautiful. Your room is magnificent. Love the color of paint. Do you know the color? The room is just beautiful. I especially love your paint color. Blue and white just can’t be beat, in my opinion. Any guest would rest well and enjoy your room. 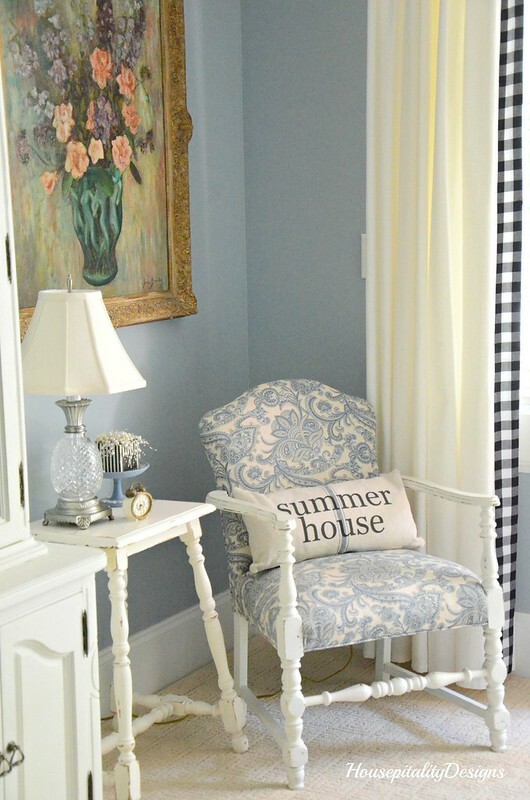 Love the summer house pillow! Packing is never fun. I am actually still unpacking and we have been in our house for 9 months almost. After having to pack an entire 3700 sq ft house pretty much myself and move twice and to storage I kinda have just been unpacking at my own pace. I figure by the end of the year I will have it all done…mostly. LOL. 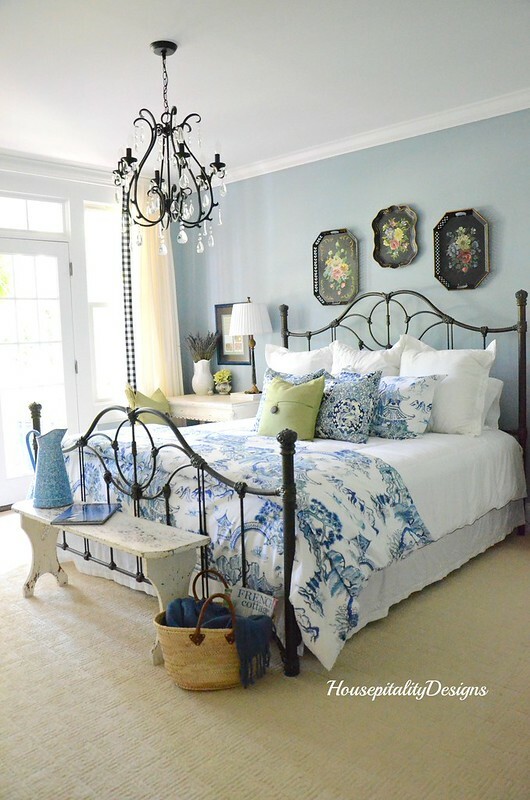 What a beautiful room refresh, I love the black platters, they really add to the room. Would love to have you share your blog on #OMHGWW this week! I am in love with your blue walls and black decor! What a lovely bedroom for guests to stay.